The homegrown international automaker, Bajaj Auto is planning to launch two new bikes at the upcoming 2018 Auto Expo. According to reports published online, the first one is the refreshed version of the outgoing Bajaj Avenger Street 150 while the details available regarding the second model are scarce. The second model expected to launch at the upcoming expo is expected to be the 2018 Bajaj Pulsar RS 400. Bajaj has launched several bikes under the RS and NS sub-brands and some of these have been immensely successful in creating an entirely new segment. Bajaj Auto stopped participating in the Auto Expo since 2016 with the upcoming expo being the second time the company will abstain itself from the show. We expect Bajaj to showcase their latest offerings before the expo starts, exactly like they did in 2016. The upcoming Bajaj RS 400 will be the fastest Bajaj upon launch and will inherit several mechanical and aesthetic components from the Dominar 400. 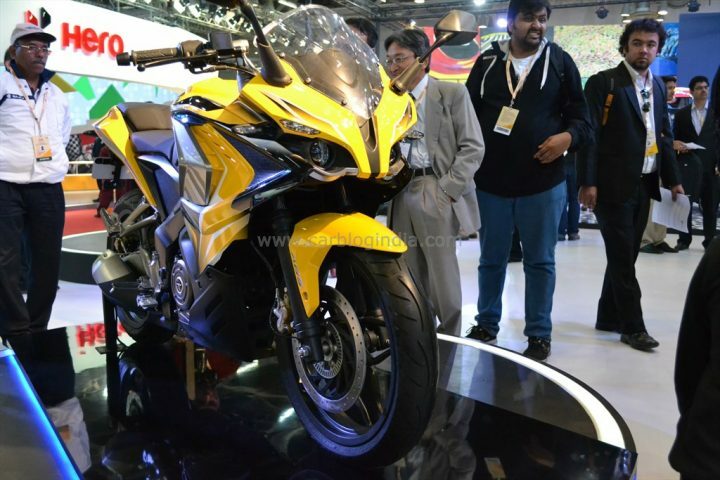 The upcoming sports bike from Bajaj i.e. 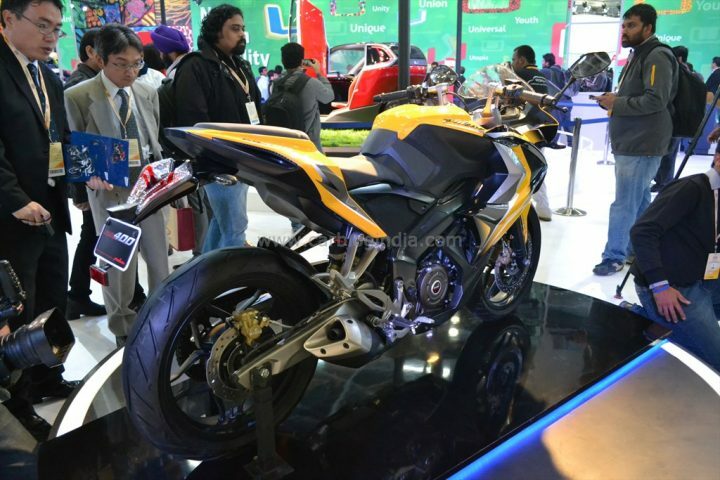 the RS 400 will take cues from the Bajaj SS 400 concept unveiled at the 2014 Auto Expo sporting full side fairings and an intimidating facia holding dual projector headlamps with LED daytime running lights. Bajaj currently retails the RS 200 and we expect the RS 400 to be designed and implemented the same way as its younger sibling. The split-seat design will be carried over amidst certain changes to make the bike comfortable for highway cruising as well. The side fairings will be highlighted with sharp curves and creases to give the bike an edgier look and improving aerodynamics. The fairing will also help in terms of heat dissipation away from the rider’s legs improving aesthetics. The large windscreen up front should also help the rider avoid wind blasts at high speeds decreasing fatigue. The upcoming ‘race sport’ category bike from Bajaj could highlight like bold fuel tank, new taillamps, analogue tachometer and digital instrument cluster. The Bajaj RS 400 is expected to be showcased sometime in January with the launch taking place in the following months. Bajaj officials have not released a certain timeline for the launch of the upcoming bikes and we shall update you regarding the same as soon as we get confirmation. The 2018 Bajaj RS 400 being the fastest Bajaj ever, will be positioned above the Dominar 400. The expected price for the upcoming sports bike will fall between INR 1.75 lakh and INR 1.90 lakh. If reports are to be believed, the 2018 Bajaj RS 400 will share its mechanicals with the Dominar 400. The Dominar sports a 373.2cc single-cylinder, liquid-cooled engine with Bajaj’s in-house DTS-i technology. It is the most powerful engine on offer by the automaker right now. On the Dominar 400, the engine is capable of producing 35 bhp of power and 35 Nm of torque. The RS 400 will share the same engine but with a different state of tune with even more power than its sibling. The engine will come mated to a six-speed gearbox. Expect the upcoming 2018 Bajaj RS 400 to return an average fuel consumption of 25 kmpl to 30 kmpl while hitting a top speed of around 160 kph. The 2018 Bajaj RS 400 is expected to sport telescopic forks up front. A monoshock will do its duty at the rear. As for the braking, the upcoming sports bike from Bajaj will employ 320mm disc at the front while the rear gets 230mm disc. Dual-channel ABS will be on offer upon launch.